Joseph Hunter was born in Aberdeen Scotland in 1842. Besides his Scottish heritage, he held in common with many St. Andrew’s men the experience of traveling to the Cariboo gold fields with the dream of making his fortune. Other congregation members who were also in the Cariboo included Alexander Blair Gray, James Hutcheson and Henry Frederick Heisterman. Mr. Hunter found political success. He was elected to the first provincial government in 1871. He also worked for a time surveying the frontiers and passes of the province as did another church member, Otto Tiedemann. In 1878 Joseph married Fannie, the daughter of John Robson, and six years later moved to Victoria and became a member of St. Andrew’s. 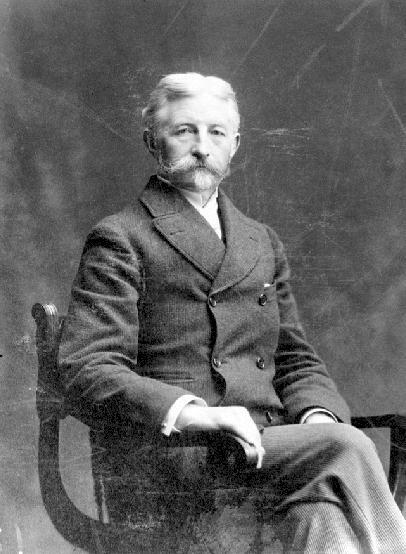 Perhaps through his affiliation with St. Andrew’s and the connections made at church, Mr. Hunter became Chief Engineer of Robert Dunsmuir‘s Esquimalt and Nanaimo Railway. While not particularly active in the church’s organization or activities, he and Fannie were consistent attendees. His public ambitions still not satisfied, he ran for the provincial parliament in the 1890 election and won a seat in the riding of Comox. Mr. Hunter demonstrates the interconnected nature of the congregation in Church and community along with much of the shared history of many of the St. Andrew’s congregation.